Picture an exciting world of art where all the artists work together to hone their skills to perfection under the expert guidance of qualified instructors. 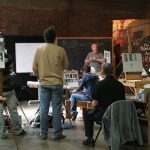 When you enroll in an artist workshop with us, you will be immersed in an atmosphere where there are constant, informal discussions about art with lots of brilliant ideas being tossed around, and relaxed, constructive feedback offered with the sole intention of helping you improve on your technique. Ask all the questions you want and listen to the concerns your team mates have. Think of it as a community of artists, each completely serious and dedicated to their art and helping each other along. At some of the artist workshops we organize, we also invite guest speakers who are stalwarts in their specific fields, to talk to you about their experiences with the world of creativity. You will be working with like-minded artists like yourself whose sole aim is to take their art to the next level. We have a meeting every month where critiques are offered by your peer group. These critiques will help you learn to analyze and understand your art and that of your team mates. You will also learn to express art in words, either by talking about it or writing about it so you can explain what you’re trying to say through your painting. Why is this essential? Because simply being a brilliant artist is not enough. You also have to learn about the business aspect of the world of art and how to submit your work to galleries and publishers. In essence, you will learn how to market your art. At our art classes, students can also put together portfolios under the direction of our instructors so they can be prepared for submission when looking to get into the art academy of their choice. Artist workshops can do all this for you and more. Check in with us at the King Art Studio and find out all about the exciting opportunities and avenues our workshops can open for you.